The fruit of decades of research and long-standing friendships, it's a dazzling show filled with beautifully crafted and adorned functional objects -- camel saddles of the sort Seligman rode in, tents, bags, swords, amulets, cushions, dresses, earrings, spoons and drums -- made of leather, wood and silver, bits of ebony, agate beads, brass and gold. Drawn from museums in the United States and Europe -- including UCLA's Fowler Museum, which created the exhibition with Stanford -- they express the qualities prized by mobile people who value aesthetic beauty in all things great and small: refinement, clarity of line, flawless workmanship. Like people throughout the ages, Westerners, Arabs and Africans, Seligman was intrigued by the mystique of the Tuareg, who ruled the caravan trade routes through the vast Sahara for more than 1,000 years. They were often called the "blue people of the Sahara'' because of their trademark indigo-dyed cotton veil/turbans (tagulmust), worn by the men, which stain the skin blue. Masters of the harsh desert world, they were fierce fighters who valued their independence and freedom of movement. Tom Seligman set out on a 10-day camel trek through the Sahara on Christmas Day 1979 to photograph ancient rock paintings. The African-art scholar was fascinated by the Tuareg -- the proud North African nomads famous for their desert survival and fighting skills and for the elegance of their attire, carriage and art -- and he traveled the harsh terrain in a four-man caravan led by a Tuareg camel breeder named Azuri. "By the end of the first 10-hour day, I was so exhausted I just laid down on the ground and slept. After a while I got conditioned, and I got into it,'' says Seligman, the director of Stanford's Cantor Arts Center, where the exhibition "Art of Being Tuareg: Sahara Nomads in a Modern World,'' opens Wednesday. The fruit of decades of research and long-standing friendships, it's a dazzling show filled with beautifully crafted and adorned functional objects -- camel saddles of the sort Seligman rode in, tents, bags, swords, amulets, cushions, dresses, earrings, spoons and drums -- made of leather, wood and silver, bits of ebony, agate beads, brass and gold. Drawn from museums in the United States and Europe -- including UCLA's Fowler Museum, which created the exhibition with Stanford -- they express the qualities prized by mobile people who value aesthetic beauty in all things great and small: refinement, clarity of line, flawless workmanship. 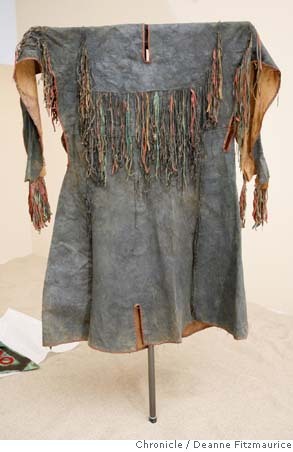 "This fringe is completely unnecessary, it's purely decorative,'' says Seligman, a tall man with a bushy white beard, pointing to an exquisitely detailed and crafted red and green leather bag made by a Tuareg woman in Niger, one of the modern African nations and former French colonies (the others include Mali, Algeria and Burkina Faso) where the Tuareg live and struggle to maintain their culture. "It's about embellishment, but it's also about movement. When the animal is moving, it's moving, creating vibrancy in the world. When the wind is blowing, your robes are blowing. The Tuareg prize the overall elegance of the piece, the motion of the piece, and the utility of the piece. In addition to the 200 or so pieces, the show also will feature Tuareg artists and smiths, members of the social class called inadan, working in the galleries, videos of other Tuareg artists at work and at home, banners bearing photographs of a wide range of people and their words about what it means to be Tuareg. A trio of Tuareg musicians from Niger called Tidawt, who merge the Arabic and African strains of traditional Tuareg music with electric guitars and American rock, will perform at the exhibition opening party Thursday. They also will play a benefit at Slim's in San Francisco June 4, jamming with drummer Mickey Hart on a bill that includes bluesman Markus James and a group of West African musicians. "We're trying to make it more alive,'' says Seligman, 63. He first spent time with the Tuareg in 1971, when he traveled through the Sahara after serving in the Peace Corps in Liberia. Later, as a curator at the de Young Museum, he did a lot of field research in Liberia until the political situation there made it untenable. Seligman visited places like Timbuktu in Mali -- which was founded by the Tuareg, whom he describes as a "seminomadic pastoralist people of North African Berber origin" -- and Agadez, Niger, where he was befriended by a couple of well-known inadan: silversmith Saidi Oumba and his wife, Andi Ouhoulou, a leather artist. Two of their nine children, sons Ousmane Saidi and Salah Saidi -- the Tuareg take the father's first name as their last -- will be at Stanford, demonstrating the age-old crafts they've adapted to meet the contemporary demands of the global marketplace (you can buy Tuareg jewelry online and Hermès has commissioned Tuareg silver work . They will work near a life-size tableau of their father's corrugated tin shop, where two mannequins representing their parents, formally garbed in the shimmery indigo turbans and veils that signify the Tuareg, stand over a table displaying their fine jewelry and leather work. Like people throughout the ages, Westerners, Arabs and Africans, Seligman was intrigued by the mystique of the Tuareg, who ruled the caravan trade routes through the vast Sahara for more than 1,000 years. They were often called the "blue people of the Sahara'' because of their trademark indigo-dyed cotton veil/turbans (tagulmust), worn by the men, which stain the skin blue. Masters of the harsh desert world, they were fierce fighters who valued their independence and freedom of movement. 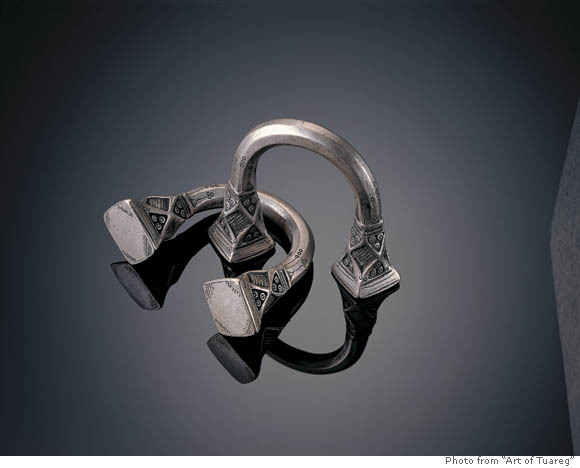 In addition to making all the necessary objects, the inadan function as conduits to the spirit world and arrangers of marriages and deals between chiefs of extended Tuareg families and federations. Some scholars believe they are partly descended from Jews driven from southern Morocco in the 14th and 15th centuries. 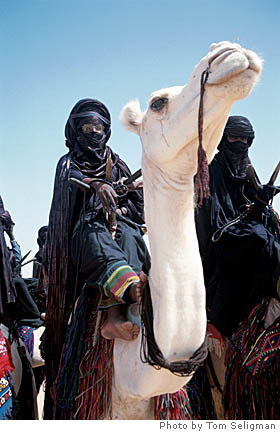 They mingled with the Tuareg they encountered on the trade routes. But the amulets they make serve a spiritual function. Inside these intricately engraved silver or clean leather amulets are Koranic verses written on paper by a marabout, or Muslim religious teacher. The paper is folded into what's called a magic square, passed through incense by the marabout and then taken to an artisan to be encased in a custom-made amulet. Seligman wears three leather ones around his neck. "I believe they protect me,'' says the museum director, who has also gone to marabouts before making a journey to ask for safe passage or good health. The man writes a Koranic passage on a wooden board, then washes the ink away with water and has the person receiving the blessing drink the ink. 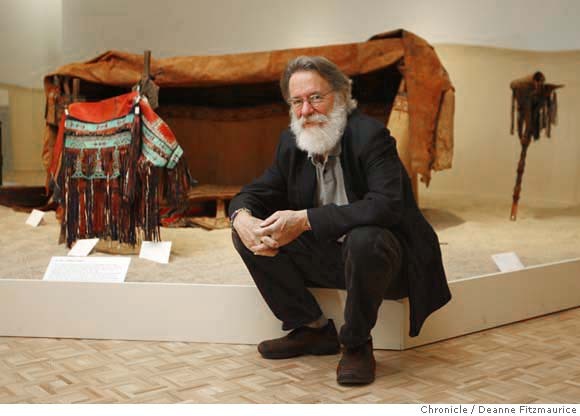 It's tasteless, like water, says Seligman, a native San Franciscan who practices no religion but takes spiritual nourishment "where I can get it. I freelance,'' he adds with a laugh. After the former French West African colonies became independent countries in the 1950s and '60s, "all of a sudden you have borders, and these nomadic people are being told they have to have passports, and have to pay some fee to cross a line in the sand that nobody can see,'' Seligman says. 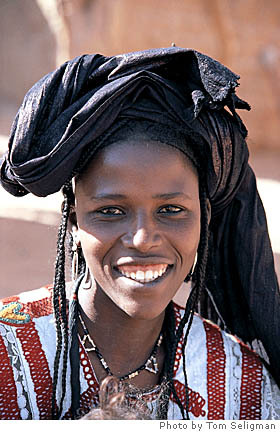 "The Tuareg want to continue to be who they are and control their destiny.'' He mentions a Tuareg acquaintance who said without the slightest arrogance that he was as confident with a surface-to-air missile as he was with hammer and anvil. 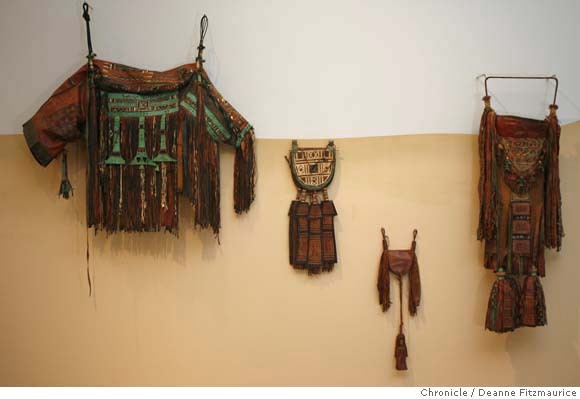 A number of Tuareg people worked with Seligman and his associates on this exhibition, the largest of its kind to be shown in the United States and the first to tour nationally. "They really like that it's being done,'' Seligman says. "It shows respect for their art, for them and their culture." -- To hear a sample of contemporary Tuareg music, go to sfgate.com/eguide. -- A concert to benefit the Tuareg, through the Nomad Foundation, featuring the Tuareg trio Tidawt from Niger, drummer Mickey Hart, blues musician Markus James and the West African group Wassonrai and others, will be held at 8 p.m. June 4 at Slim�s, 333 11th St., San Francisco. Tickets $25. For tickets, call (800) 225-2277 or go to www.tickets.com or www.virtuoso.com. For information, call Slim�s at (415) 255-0333 or visit www.slims-sf.com. Art of Being Tuareg: Sahara Nomads in a Modern World: 11 a.m.-5 p.m. Wednesday-Sunday and until 8 p.m. Thursday from May 30 to Sept. 2 at the Cantor Arts Center on the Stanford University Campus. Admission is free. For information, call (650) 723-4177 or visit www.museum.stanford.edu. E-mail Jesse Hamlin at jhamlin@sfchronicle.com. i think that is very important to help these etnies, these nomadic groups. because they are humans and they have equal oportunities, as all of us. in my case i can say that i am basque and the powerful men are not leaving my natal language, the EUSKARA, in peace. and it wants to be oficial. a basque young boy. INDEPENDENTZIA!